Having discovered a broken spoke in my bike’s rear wheel, I was reticent to use it in case further spokes, now under increased stress, failed. Cycling 25 miles is fine but I really didn’t want to be 12 miles from base having to walk back with a completely disabled bike. Having explained my predicament to our friendly campsite owner, he pointed me at a suitable repair shop in Benet, about 10 miles/15 kilometres distant. Just before leaving, Linda sent a text message confirming a promenade en barque (boat trip) at 4:00 PM. Perfect timing; we now knew the shape of our last day in Damvix – we are definitely moving off tomorrow. Putting the bicycle wheel in the car, off we went to Benet. The local market was in full swing when we arrived in Benet. We dropped off the wheel, to be collected after our marais boat trip in the afternoon, and then hit the market. Some small, sweet sardines on the market fish stall looked irresistible. Together with some local bread, a barbecued lunch beckoned. (Why is it that the French can manage the supply of perfectly fresh fish throughout a larger country than we can? We’re lucky if the fish at our fishing ports is as fresh as theirs in the centre of the country.) Back to "play some more harmonicas"! We met Linda at the appointed hour for our guided promenade en barque. Having a guide was great. Apart from our not having to do any work, we learned quite a bit about the marais. 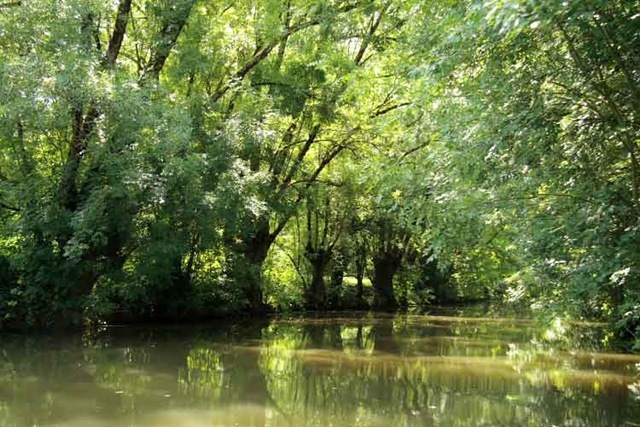 There are apparently four different words for canal: bief, rigole, conche and fossé (in descending order, from largest to smallest). All these words for canal reminded me of the Masai (sp?) in Africa, who are said to have more than 30 different words for "brown" enabling them to describe precisely their precious cattle. Our marais guide’s pièce de résistance was to pull in to a side conche, grab an oar and stir up the sediment thus releasing methane gas which bubbled to the surface whereupon he set it aflame with a lighter. Having flames dancing on the surface of the water and licking around the side of the barque was great fun. For our evening meal (another salade Niçoise topped with the remains of our barbecued tuna), we were entertained by a rally of camping cars (motor homes) in an adjacent field. After some rather bizarre sounds which, in retrospect, were probably warming up exercises, we heard what we thought were French hunting horns (like orchestral French horns but without the valves). Curiosity got the better of us and we abandoned our pastis to go and investigate. 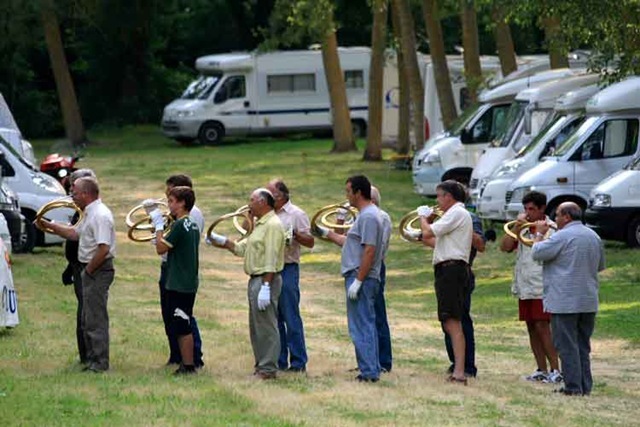 Sure enough, the massed French hunting horns of the camping car club du sud were tootling away, very tunefully, in the field next door. We were sorry when they stopped.